NextThe Byzantine Empire Strikes Back ! Could there be anything more dramatic than the ground opening up and swallowing entire dwellings, buildings, cars roads, animals and even people? This phenomenon is known as a ‘sinkhole’. Earlier this week a sink hole devastated a resort building in Clermont, Florida at the Summer Bay Resort near Disney World. It didn’t swallow it whole but it doesn’t mean that it was any less devastating! Much of the land in Florida sits on limestone caverns that are frequently weakened by water erosion. There are some alarmists who completely exaggerate that Florida just might collapse away from mainland United States in the future? Many other communities and cities are built atop of what is known as a karst formation. These formations are shaped where a layer or layers of water-soluble rocks, like limestone and natural processes wear away underground caves and fissures, eventually weakening the support of the ground above. These weak spots are known to occur naturally in the Earth surface but can also be brought on by human activity such as deep mining and drilling, excavating, heavy pumping of underground water and burst sewer or storm water pipes that aren’t detected or maintained. The sinkhole that occurred in Guatemala City in February 2007 (pictured above) is an example of human activity and not nature being the likely cause of it. Experts believe that damaged sewer pipes probably created an underground cavity, which is amazingly some 20 metres wide and 150 metres deep. Guatemala City, like Florida was built in a region that is suspect to sinkhole activity. The earth around Guatemala City is composed mostly of pumice fill from past volcanic eruptions. The ground isn’t solid rock which makes it vulnerable to erosion. Only three years later in 2010, Guatemala City suffered in the wake of Tropical Storm Agatha from another giant sinkhole. It is believed that heavy rain contributed to the street collapsing again in similar fashion to the 2007 sinkhole. 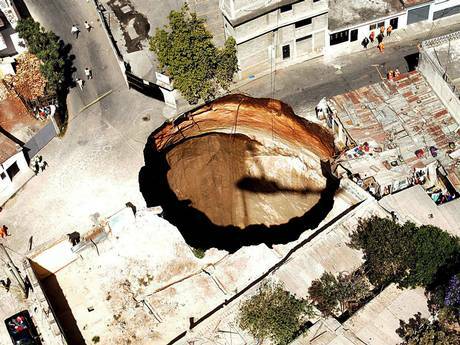 Problems with sinkholes will likely remain ongoing in places like Guatemala and Florida. They cause millions of dollars in damage and are an insurance companies worst nightmare. The Great Ravenna Boulevard sinkhole (pictured below), was one of the largest and most expensive sewer collapses in the United States, which occurred on the night of Nov. 11, 1957, in Seattle. A sewer trunk collapsed 20 metres below the street. Repairs took two years to complete with a complete sewer bypass of Ravenna Park. Fortunately fatalities and injury are rare and most sink holes are small contrary to popular belief. They are not unique to the two American regions featured in this brief history of, they can actually occur anywhere in the world from China to Jordan. Photo credit:. The Great Ravenna Boulevard sinkhole photo is from the Seattle Municipality Archives and is used under the Creative Commons Attribution license. The Guatemala City sinkhole photo is by Daniel Le Clair, Reuters. I make use of this image under the fair use rationale because there doesn’t appear to be any other free alternative. The aerial view of the photo shows the dramatic size of the 2007 sinkhole, which helps me best illustrate the dramatic nature of sinkholes that words alone cannot say. Wow! I was amazed when I saw the sinkhole story on the news. There is so much we don’t now when we buy property. Home buyers have to be informed when there is a superfund site nearby but are home buyers informed if their property is built on a karst formation? Probably not.